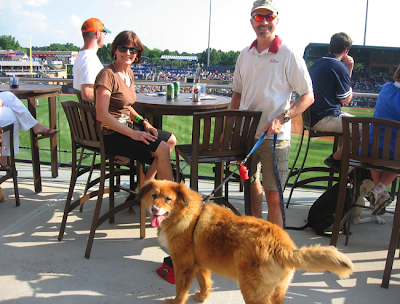 …it took place Tuesday amid a recession at the Durham Bulls Athletic Park, where downtown was welcoming The Law Offices of James Scott Farrin to a building beyond the left-field wall. The law firm's decision to move from Imperial Center, near Research Triangle Park, to 50,000 square feet at downtown's Diamond View II office building was one of the Triangle's biggest deals of the year. By executive fiat: Henceforth and to wit, no lawyer jokes will be tolerated, ex post facto, habeas corpus, et cetera. Otherwise, I admit to being jealous of the Diamond View tennants. They have a wonderful view of the DBAP field, not to mention balconies. Our offices are subterranean. Still, it's a privilege to work in and around (even beneath) a ballpark of the DBAP's caliber. If you don't need 50,000 square feet of office space, just click here to purchase a ticket. No bad seats...just diamond views! Ouch! The Bulls had lost eight in a row, but that got fixed on Monday night. 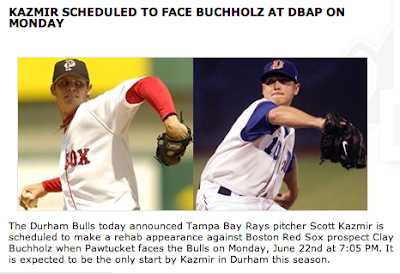 Durham beat Pawtucket winning the Kazmir-Buchholz pitching duel. GAME OVER. What a relief! TV5 grabbed a good clubhouse interview with Scott Kazmir. Wow! 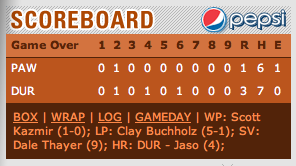 Even better, the losing streak ended with an attendance record. Bulls' paid attendance was 40,339 Fri-Mon...a series record! Very gratifying. Fighting the rainy weather and sluggish economy has been making us a little crazy in the front office. What a relief! 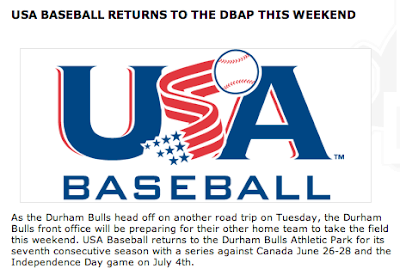 Join us this weekend - for America's best amateur baseball - at the Durham Bulls Athletic Park. 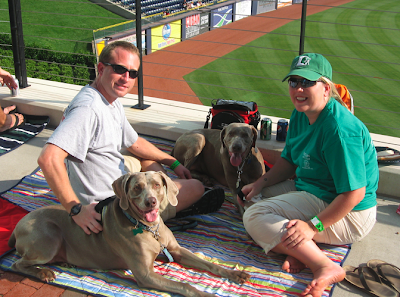 We had a great weekend at the Durham Bulls Athletic Park. Despite the team's losing streak 30,000 people bought tickets for the Fri-Sat-Sun series with Pawtucket, Boston's farm team. Not braggin. Merely grateful. ...but it get's even better tonight: We've got a Major League pitching duel, and Bulls' GM Mike Birling has arranged for post-game fireworks to cap off a great evening of the National Pastime, as the Tampa-Boston rivalry plays out in our ballpark. Click here for more on tonight's pitching duel. And join us at the DBAP! 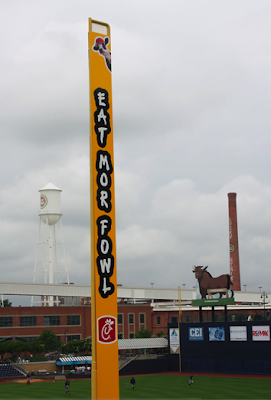 The foul pole in the DBAP’s right field corner has been transformed into a FOWL POLE…thanks to Chic-fil-A. CfA is our newest ballpark dining option. If you are a CfA fan you know that the restaurants are closed on Sunday. 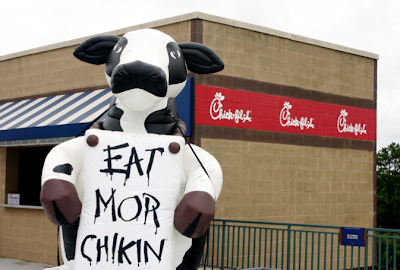 Consequently, we won’t be serving up CfA on Sundays. I certainly respect that. Read more about the man and his business philosophy. Click here. It’s inspirational! The current home stand continues through June 22nd. Join us for Bulls' baseball and a Chick-fil-A sandwich. The Bulls broke their single game attendance record on Friday night, 6/19. Paid attendance: 11,300. Breaking a business record in a record recession; that's a good omen! Thanks to Cree...to their employees and family members. I'm pretty sure that their humongous company picnic pushed us over the top. US News and World Report has released its Best Places to Live list for 2009 and Durham is in the Top Ten! 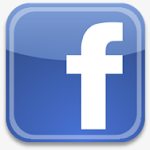 Click here for story. It just so happens that we have our last springtime day game this Wednesday at 1:05. The weather looks promising. The Bulls - currently leading the International League South Division - play the Lehigh Valley Iron Pigs, the Philadelphia Phillies Triple A affiliate. It’s gratifying to get a little attention for the day games. We try to schedule one during each home stand in the spring. I’m sure it will take a few years for this to catch on, but it seems appropriate for a downtown ballpark – especially in our resurgent downtown Durham. There’s more upside: The players are only promised an off day every thirty days. What a grind! So, the occasional daytime games provide an evening off for the team and staff. Join us for an afternoon of the National Pastime on Wednesday. Take a personal leave day or call in sick. I’ll sign your physician’s note. It’s an immutable law of Internet promotion that pet photos hype web traffic. And this is a shameless attempt to boost my blog’s circulation. 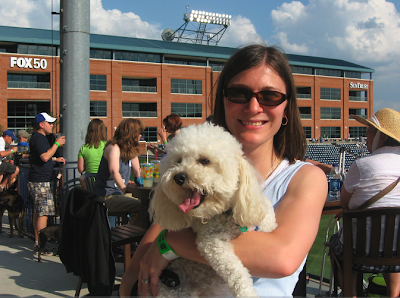 For last Sunday’s game, the Durham Bulls teamed up with the Wake SPCA, the Animal Protection Society of Durham, and Paws4Ever (Orange Co.) to present Bark at the Park. 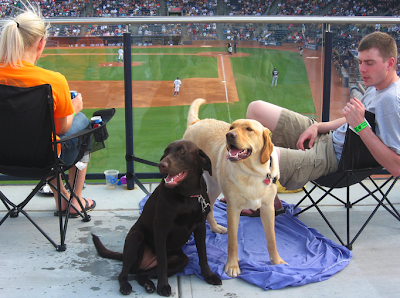 Dog lovin’ Bulls’ patrons had the opportunity to bring their pets to the game and watch from the Diamond View II plaza atop the Blue Monster. Best seats in the house! So, here are the pix. Please tell a friend that my blog is awash in canine cuteness. 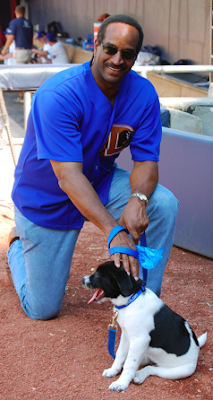 WRAL Anchor Gerald Owens with the TV5 newsroom mascot. 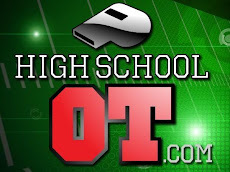 Check out their home page. There's a poll to name the pup on the right-hand side of the screen. 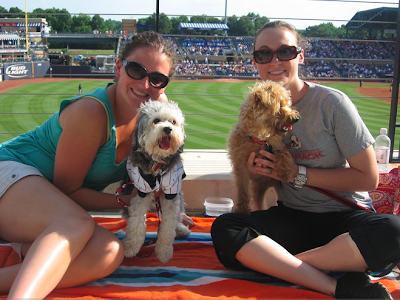 Thanks to pet paparazzi Lea Johnson of the Bulls staff for these exclusive photos of the event.